My mother and I were traveling. From three days in Brussels and Brugges to three days soaking up London. Our days would get busy quickly, but I thought it might be nice to introduce my mom to London by going to a district to experience, too: Covent Garden. A high tea and stroll around Covent Garden sounded like a great afternoon. I surprised my mom, so I don’t know if she’d thought up many expectations other than delight. But I’d had a little time to think about it. I knew there were many, many places to have high tea and that I could have read reviews of different ones forever, but I chose a recommendation from my hotel and reserved a table for us at 4:30pm (which is when I choose to think is the perfect time). B Bakery exceeded my expectations. It was charming! The decor was whimsical, pink and chic; both the artistry, the mismatched, perfectly delicate china and the pastries. It was a girly, feminine, luxurious experience of one tantalizing pastry and finger sandwich after another. Then scones. With clotted cream and jam. So Totally A Vision of our Perfect British Life. So Totally A Perfect Mother-Daughter/Girlfriend/Traveler’s Afternoon in London. Would afternoon tea be on your London agenda? Never ‘done’ a posh afternoon tea. I know they are becoming extremely popular – an echo of more gentile times when the upper classes used to bridge the hours before a late dinner. I hear that you can pay a fortune for tea in the top London and Dublin hotels. I’ll stick to a sandwich. It’s a fun experience, for sure. Especially if it’s not something one can do in their own part of the world. I like a sandwich, too, and the finger sandwiches in this tea were quite tasty! This is a huge bucket list item of mine- to have afternoon tea in London. I love afternoon tea and I’ve had it several times, but I want to have it in London. This looks like the perfect place and I LOVE all the pink!! Hopefully going to London in the spring with my mom so this is great timing! Do it, Heather! It’s such a great mother-daughter outing and this place was charming! Lots of shops to wander around before and after, too. I debated the bus tour, but decided to try that another time. I wanted to focus on the “tea” itself and saved sightseeing for a separate experience. YES! Afternoon tea would most certainly be on my agenda when visiting London! I always try to make tea at home, but then never make a proper tea I suppose. Guess I better start looking up videos or something on how to make a proper tea. I love the idea of high tea and so wish I could go with my mom too. Will have to arrange a time and toast to her. Wish it could be in Covent Garden! A girlfriends’ excursion is nice, too. And you can still toast your mom. This makes me miss London so much! I lived in south London for a few years and loved bringing visitors to afternoon tea. I also loved having scones/jam/cream on hand in the house! I would miss this, too! Afternoon tea is just so adorable. 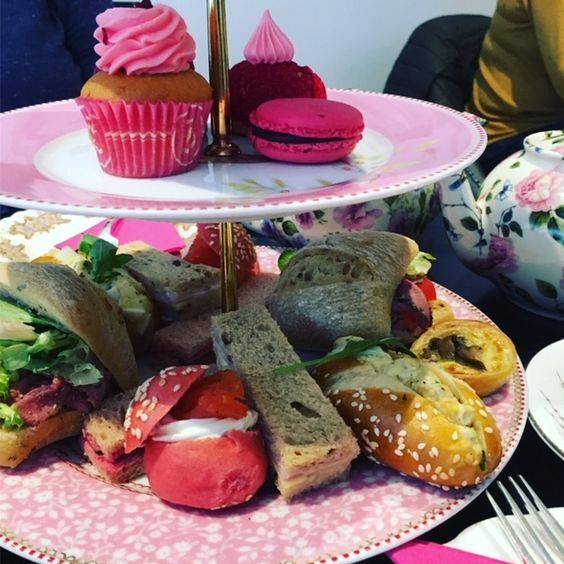 Next time I’m in England, I’m finding a vegan afternoon tea if it’s the last thing I do! I love all the pink food items too! I’m sure there are plenty of options and I have no doubt you’ll find them! I have a low carb lifestyle, so there probably isn’t a lot I can eat at English tea time, except the cucumbers out of the sandwiches and maybe the clotted cream (if they don’t add sugar) but I have always been impressed with how beautiful the food is. It truly is a treat! There probably isn’t much you could eat, but even having tea in such a cute little place is fun.